Sailboats have been enjoying the "unique" winds of the Gatineau River since 1928 when the Gatineau Valley was flooded from Chelsea to Cascades as a result of the construction of the Chelsea Dam by the Gatineau Power Company. The river was actually quite wild before the dam was built, in fact, there was a seven metre waterfall (named Eaton's Chute) between the lighthouse point and the dock immediately across the river. In the evening of September 2, 1962, in the living room of the late Ivan Herbert of Gleneagle. Mr. Herbert, Patrick Evans, Allan Richens, Gerry Byers and the late John Winfield got together to discuss mooring arrangements for the following summer. All meeting attendees were landlocked residents of Chelsea who had access to, but not ownership of, waterfront on the river. Patrick Evans presented the idea of the formation of a club whose relatively simple purpose would be to procure timbers for a floating dock to be used by the membership. The dock would be moored at the bottom of Gleneagle Rd. That night the Gatineau Boating Club made its way into being. The Club's pennant and colours were also chosen at this meeting. The second meeting of the Club took place on September 19th. At this meeting the Club's first Directors were elected: President: Ivan Herbert, Secretary: Patrick Evans, and Treasurer: Alex Wylie. The third meeting of the Club was on October 3rd, at this meeting the Club's name was changed to Gatineau Yacht Club. The news of the Club's formation met with much enthusiasm, within six weeks the "Original Five" had grown to 24 and by the start of the first full season in 1963 there were 52 adult and 26 junior members. It may have been a shock to the original members of the Club how well their idea was received ,but what a great idea it was!! The snowball was now rolling and gathering momentum, the first unfortunate set-back was that Ivan Herbert resigned his Presidency in November, George Cochrane was elected to the new title of Commodore. November also saw the Club's first public meeting. (The Board of Directors all agreed that if the Club was going to be run it was going to be run properly!). The first fees for the 1963 season were approved. By December the first draft of the Club By-laws had been received by the Board of Directors and membership status had been accepted by the Canadian Yachting Association. February of 1963 saw another general meeting. At this one the By-laws were accepted and the Club's first trophy, the Snave (Evans spelled backwards), was presented. The position of Fleet Captain was initiated and filled by Allan Richens. And the Club's name was changed (for the second time) to what we know it as today: The Gatineau River Yacht Club. The rapidly growing membership brought with it the need for bigger thinking to accommodate everyone. The plans for the original docking installations were enlarged. At the time the Club did not own the islands so the docks were Eastward along the middle of the bay. The first boat moored on the new dock was the "Spray" owned by Patrick Evans. Arrangements were also made to rent the white cottage at the bottom of the hill (now renovated and owned by Ian Davidson). The first ever Club race was held on June 16th, 1963 and was won by A. B. Fraser-Harris. The summer of '63 was a flurry of activity. The membership grew by leaps and bounds, the first Invitational Regatta was held, the Junior Program got underway, and a treasure hunt (which evolved into our annual Sailorama event) was held. By the end of this triumphant first season the membership had grown to 181 and the inaugural Annual Meeting was held. The first item on the agenda (besides a whole bunch of applause for the "Original Five" and how much had been accomplished in those first twelve months) was how the Club was going to accommodate such exponential growth with the facilities that existed at the time. The consensus was that it couldn't, so a committee was formed to come up with a solution to either expand the existing facilities or find new ones elsewhere. The solution wasn't long in coming, Frank Macintyre, a real estate agent and (thank goodness!) a member of the Club, called Pat Evans to tell him that the islands were up for sale. The call came the afternoon before the Annual Meeting, the timing didn't even allow Pat to contact either the Commodore or anyone else on the Board of Directors. The whole thing was brought to the membership in one shot. The islands were owned by the late Air-Commodore Bennett, who had purchased the islands as a present for his wife. Perhaps it was those pesky sailing enthusiasts across the bay that brought about his decision to sell but what a blessing for us!! The only problem was how the Club could possibly afford them.....?? Suggestions for financing were discussed, amended, abandoned and revisited time and again. After much head-scratching (and the inevitable anxiety that someone else might beat the Club to it) a scheme whereby the membership would be asked to each put up a membership would be asked to each put up a $100.00 loan was adopted. So, finally the arrangements were made to present the offer. On April 8th 1964, the Club offer was accepted and the islands were ours!!! Soon after the ownership was transferred, the catwalk was swung off the mainland and extended a wee bit and attached to its new home. The Gatineau Boom Company, who until 1993 floated pulp logs down the river to the mill in Gatineau, assisted the extension of the catwalk by donating a number of redwood boom timbers. The buildings on the islands were a small cottage and several outbuildings that served at guest houses. Within the next year the interior walls of the "new" Clubhouse were removed to make one large room that was subsequently decorated in a requisite nautical theme. The kitchen was reequipped and a new front door added. The guest rooms were revamped into change-rooms complete with lockers looted from every nearby school. There were a number interesting items jettisoned from the ramparts including a purple piano(?!!) a coke cooler and an old oven, all of which, to the best of everyone's knowledge, are still making excellent fish habitat. The Otter Prams, the most junior-oriented boats of our instructional fleet were delivered, sponsorship for which was arranged by A.B. Fraser-Harris. It is proudly noted that all of the original boats are still active today (1998). Over the next couple of years additions and renovations to the facilities abounded with almost all of the work done by volunteer committees. Docks were built, decking was put on the catwalk and a deck was added to the upriver end of the Clubhouse. A lighthouse, built in Mr. Ed Quipp's basement by Mr. Quipp and Pat Evans was delivered by pontoon barge to the race point. The previous building that was used to house the race equipment too-closely resembled an outhouse (in its previous existence it actually was an outhouse owned by Frank McIntyre, it too was brought over by boat) so the effort was made to replace it with something more esthetically appealing. The little shack was moved to where is now the tool shed used for storage of tools and fuel. The car park was acquired in 1965 which brought some much-needed relief to the road leading down to the Club. Only one car has actually ever taken an unwanted dip in the River. In 1972 a Volkswagen bug driven by Graham Parkinson, a former Manager and Commodore of the GRYC (and figurehead when he used to sit on his dock near the lighthouse point and yell jovial obscenities at unsuspecting racers), tested the amphibious abilities of his car when the brakes let go as he was launching a boat. 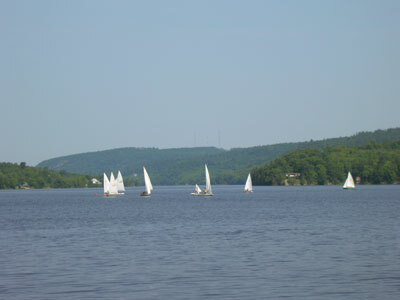 The Club has hosted a pile of races during its lifetime, the most prestigious of which was National Junior Centennial Championship Regatta which took place in August of 1967 with well over 220 attendees (racers and entourage). Young sailors from all over Canada came to enjoy activities at the islands and the Nation's capital all of which were organised to help celebrate Canada's 100 birthday (what better place to spend it?). The Pram Dock where our fleet of Club boats is stored and maintained was built in the summer of 1975 which allowed wonderful dry berthing for the amazingly popular Laser sailboats. The GRYC at one time had the largest Laser fleet in the region. In 1977 it was decided that the original Clubhouse was starting to show its age and plans. were made to design a suitable replacement. Another former Commodore, James Strutt, who was also the Dean of Architecture at Carleton University lent his talents to the project. The result, after a few modifications to the original plans, are what you see today (1998). The entire project was undertaken by the members of the Club, the old Club House was slowly torn down as the new one was being erected. Construction was supervised by Mr. Bill Stranks, and assisted by Blaire Erskine, both of whom spent many, many days toiling under the hot sun. The building was commissioned by several local dignitaries and the Philemon Wright High School Band. The festivities took place during one of the rainiest days to hit the region in years. It was as if the old Clubhouse was protesting its replacement. After the new Clubhouse was finished, everything but the floor of the old one was taken down and removed. The old Clubhouse floor made a great deck for a season or two but it quickly succumbed to the elements. A new deck designed by Doug Clancy was built by another enthusiastic work party in 1982. En 1977, après avoir constaté que le club-house prend de l'âge, on entreprend la conception d'un immeuble de remplacement. James Strutt, autre ancien commodore, qui est aussi à l'époque doyen de la faculté d'architecture de l'université Carleton, collabore à ce projet. Le résultat, obtenu après quelques modifications aux plans initiaux, est l'édifice que vous voyez aujourd'hui (1998). Le projet est entièrement réalisé par les membres du Club. L'ancien club-house est lentement démoli, au fur et à mesure que le nouveau prend forme. La supervision des travaux est assurée par M. Bill Stranks, avec l'aide de Blaire Erskine; tous deux passent de nombreuses heures à s'activer sous un soleil de plomb. L'inauguration de l'immeuble se fait en présence de plusieurs dignitaires locaux et avec la participation de l'ensemble musical de l'école secondaire Philemon-Wright. Les fêtes se déroulent alors que la région connaît une de ses plus abondantes chutes de pluie depuis des années. On dirait que l'ancien club-house proteste contre sa démolition. Une fois le nouveau club-house terminé, on fait disparaître toute trace de l'ancien, à l'exception du plancher, qui fait une excellente terrasse pendant une saison ou deux, mais qui a tôt fait de succomber aux intempéries. En 1982, on construit une nouvelle terrasse, conçue par Doug Clancey, à l'occasion d'une corvée qui se déroule dans l'entousiasme. On August 5th, 1985 the original lighthouse was blown down (and the catwalk blown up) by a terrific storm1. The new lighthouse was built in 1987 by John Pomeroy, Bruce Lorimer, Don Henning and Lee Anne Johnston. It was dedicated to the memory of John's brother Hugh who was tragically killed in 1986. The cat-walk was re-built in two stages - 1986 and 1987 - under the supervision of Don Henning. In an exercise of tremendous co-ordination the sections were pre-assembled in the car park, they were then carried down to the water by trailer, where the flotation was installed. The docks were then floated out into position, there the decking was finally nailed on. It was certainly a strange thing seeing the old catwalk being towed away after having been a part of the Club for so long. In 1987 John Pomeroy found that the outhouse-sized tool shed was getting a trifle small for everything that was being stuffed into it, so rather than build another why not re-commission a building that wasn't being used? John set his sights on the old Managers Office. It's original location was in the trees just off the deck at the north end of the Clubhouse. (Nothing like a challenge!). With the help of the two swimming docks, the Godbout's trailer, a Boom Company tug with several crewmen, and some of John's completely sceptical friends, the Office was lowered down the steep hill, on to the raft and towed around the island to its new location where it serves its new role very well. Sailboarding picked up in popularity in the late eighties, so much so that Warren Major and several members of the "wild side" insisted on having their own dock on the north side of the island away from the more traditional riffraff. The change rooms that had been abandoned since the new Clubhouse was built were offered a new lease on life as a storage shed for the surfers armament (a bag for sailboard sails is known as a quiver and a board is a weapon!). Another major improvement to the Club took place in the summer and fall of 1995. John Pomeroy, seemingly never running out of big ideas, pestered Henry Sano into supervising a renovation to the north end of the Clubhouse. This exercise involved raising the roof and adding some picture windows and sliding French doors to compliment the wonderful view upriver. Henry, as it turned out, was a student of James Strutt, the building's original architect. Mr. Strutt was very pleased with the result, as was the membership. In 1998, Jos Woods decided that action was better than procrastination and decided to coordinate taking apart the Pram Dock which despite having been propped up with bandage tape and rubber bands for some time had fallen into almost complete disrepair (this was helped somewhat by a beaver who decided to make the underneath of the dock his home and occasionally made modifications to his lodge a the expense of the dock. Peter Guy, Erik Rask and a whole mess of part-timers rose to the challenge and over a month completely replaced the dock and doubled the size of the Pram Shack. Like anything in this world, the Club has evolved; the facilities have changed, members have come and gone, some have been born and others have died, but one thing has remained, the Club is still a wonderful place to enjoy a swim, a sail or a paddle; to hang out with old friends, meet new ones and its a great place to sit and read a book or simply enjoy the view. The "Original Five" are to be forever thanked for their efforts in bringing the Club to the members. The Gatineau River was one of the last rivers upon which logs were driven to the mill. Until 1992 logs sacks (pulp wood up to 1000 cords at a time and corralled by huge redwood boom logs) made interesting obstacles to navigate around as they made their way down river either behind a tug or merely with the river's current. Operation Clean Bottom was a plan devised to retrieve hundreds (if not thousands) of logs that had sunk during their journey to the mill. A barge and tug boat were as a base for skin divers who would go down and snare logs which would then be hauled up from the depths by rope. The darkness of the water which was brought about by tannin and other natural chemicals leaching form the logs, made for poor visibility, and subsequently made the work more difficult than expected. The operation lasted only a year before it was concluded to be not financially viable.